Alphacool HF 14 GPU ATI NVIDIA Smart Motion Universal Copper Edition – the optimal water cooler for a GPU-only cooling system. A GPU-only cooling system, that is, purely cooling the graphics card’s processors, offers a great price advantage over the complete cooling solution. With graphic cards that have been purchased cheaply, a complete cooling system is often seen as too expensive by comparison and often not even necessary. Additionally, VRAM components and voltage transformers often come with passive cooling as a factory standard and do not need a water cooler. With a high-end graphics card, the opposite is often true. With such a high-performance graphics accelerator, it seems the GPU as well as VRAM and voltage transformers should be water-cooled. In such cases a complete cooling solution for maximum performance is standard procedure. But is this economical? Complete coolers are mostly intended for specific graphics card types and are often not capable of being retrofitted. Thus the cooler becomes obsolete along with the graphics card, which can often be the case as soon as 2-3 years. The GPU-only solution is different: with the Alphacool MCX System and a GPU-only cooler, the graphics card cooler does not become worthless scrap metal when the card is changed, but can be universally adapted to a new card. The system is compatible with nearly all cards on the market and offers excellent cooling performance! Besides the well-thought-out basic concept, considerable experience and development effort have been incorporated into the design of the cooler. For example, the connecting threads stand at a 45° angle to one another, which allows for a more compact size, more spaces for hose connection while simultaneously not limiting the connection size. Naturally, the bottom plate is made of copper and thereby offers the best thermal conductivity and consequently the best cooling performance. 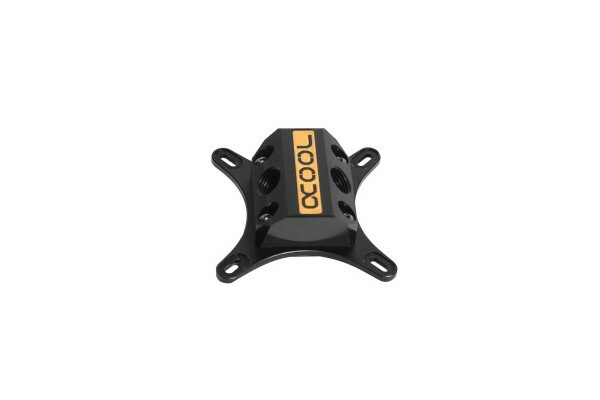 The design of the cooling structure offers very little flow resistance as well as the highest safety and first-class cooling output for your computer. The term “universal” here depends on the bracket, which, with a hole spacing of between 53.5 to 61.5 mm, has fit onto all the models tested by us until now. Despite the great variability of the hole spacing, we ask that you double-check the spacing on your graphics card before purchasing, in order to avoid a possible incompatibility. We rely on feedback from our customers for this. If you find further compatibilities, just send us an email! If you’re searching for a graphics card cooler that ensures you’re equipped for the future, the Alphacool HF 14 GPU ATI NVIDIA Smart Motion Universal Copper Edition should be your first choice! Size of connection thread: 2x ¼ in. This is compatible with R9 280x? It should be compatible, because it´s an universal waterblock for GPU. Hole spacing: 76-87mm. im beschreib steht lochabstand 53,5-61,5mm bei denn technischen daten steht 76-87mm, was stimmt ? Der Lochabstand ist 52mm - 62mm. Wo ist denn der Eingang / Ausgang? Sie können es sich aussuchen. Die Kühlerstruktur basiert auf einen einfachen Schlitzboden, daher ist die Flussrichtung nicht relevant. Moderne Kühler setzen auf Düsenplatten, erst hier wird eine Flussrichtung relevant damit die Düse ihre Funktion erfüllen kann. kan man auf eine nvidia gtx 1050ti einbahuen? Dazu müssten sie den Lochabstand der Montagebohrungen auf ihrer Grafikkarte ausmessen und mit den Angaben im Artikeltext vergleichen. Getestet wurde diese Konfiguration nicht. Ich muss meine vorrige Bewertung revidieren, mir ist ein kleiner entscheidener Technischerfehler unterlaufen. Nach dem beheben des Fehlers läuft es Super und Kühlleistung ist Erstklassig.